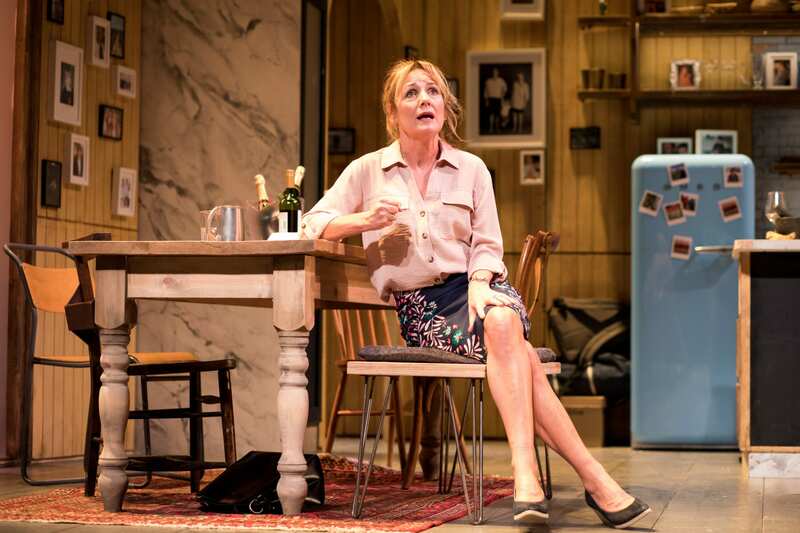 I went to the Assembly Hall theatre the other night to see Caroline’s Kitchen, starring Caroline Langrishe, Aden Gillet, James Sutton, Jasmyn Banks, Elizabeth Boag and Tom England. It was unusual because there was only one scene, Caroline’s Kitchen, so there were no pauses for scenery changes. Afterwards, I met the cast and got this great interview from Caroline. You seem to have been permanently working. When did you start working as an Actress? I trained at Elmhurst Ballet School before deciding to move into acting. I made my debut in the BBC’s Glittering Prizes. It was picturesque filming in Suffolk. I spent two years commuting to Long Melford. I adored it. We started shooting in the April and finished in September. We drove our own cars: driving to work on a June morning, at half-past seven, was magical. And we all lived in the lovely Bull hotel at Long Melford and on days off went for marvellous walks. Have you been to Tunbridge Wells before? And are you staying there or commuting? I have never played Assembly Hall Theatre in Tunbridge Wells so that is quite exciting as I grew up in Kent. It can be unsettling playing a different venue each week being and in a strange bed, but I’m good at nesting. I’m quite good at it and like it. We are in a different theatre each week which are all completely different, some modern others Victorian. If you don’t like somewhere it doesn’t matter as you are only there for a short time. If you do like somewhere you can get in your car and explore – a bit like a tourist, and see parts of the UK you wouldn’t normally. Tell me about Caroline’s Kitchen. When did you know you’d got the part? What attracted you to it and why should people go and watch it? It is about a celebrity personality chef, ala Nigella mixed with a handful of others such as Delia. Caroline, like Delia, presents a similar kitchen programme filmed from her own home which is very popular. The play opens with this TV show and very quickly we see backstage – in other words her real life – and it all unravels in one evening. It is a dark comedy that descends into a farce. Caroline Mortimer is a Home Counties, middle-class woman who appears to have a perfect marriage, perfect kitchen, perfect son who has gone to Eaton and Cambridge where he’s just graduated with a First. She is sprightly and at the top of her game – so she thinks! I think the audiences will be constantly surprised by what is going on. There is no time to get bored or drift off! Well I am going to New York with Caroline’s Kitchen from mid-April until May so I can’t really think beyond that as there is lots to be done in the meantime! Caroline’s Kitchen is written by Torben Betts and directed by Alastair Whatley.